The BNH1 is one of our latest designs in a series of headers for "nostalgia" engines. The letters "BNH" stand for "Buick Nailhead", the venerable Buick V8 engine that powered numerous dragsters, lakesters, and hot rods in the sixties and seventies. A build-up series by Doc Frohmader in Street Rodder Magazine has sparked a renewed interest in the might 401/425 engines. 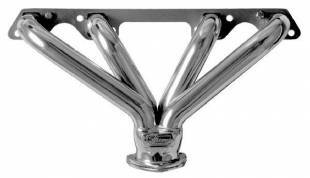 The BNH1 header fits all street rod chassis, pickups, and customs without a cross member under the center of the engine, or steering interference just behind center of the engine. Comes with all hardware necessary for installation. Engine : Buick 401/425 "Nailhead"
Our Aluminized Ceramic Coating is available and RECOMMENDED on all Sanderson Headers. We apply a multi-layer inside and outside silver ceramic coating in-house to meet our high standards of quality, and polish the coated header to a high luster. This coating provides aerospace and military technology to your vehicle to control the heat in your engine bay, improve cylinder scavenging of exhaust gases, and increase the longevity of your header investment. You can select Thermal Ceramic Coating below, and the header price and part number will be automatically updated. Sanderson Headers do not include collector bolts due to our customers' wide range of preference. When sitting in driver's seat and engine in front of you, the LEFT header would be the Driver's Side on LH drive vehicles; coincidently, means the RIGHT header is on the passenger side. See the detail image above left that describes engine sides. DIM A ................. 3" 3"
DIM B ................. 8½" 8½"